Protecting “at risk” residents from the threat of elopement has become a high priority for well run skilled nursing, assisted living and rehab facilities. 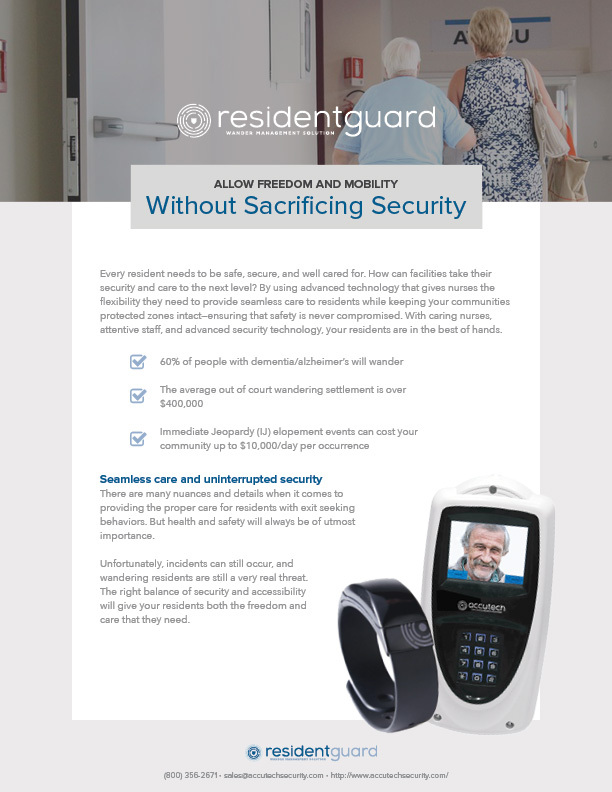 The ResidentGuard solution provides flexible and reliable wander management protection that seamlessly integrates with your community’s security protocols. "Since the first installation in 1988, our ResidentGuard systems have functioned flawlessly. Accutech has high-quality products, technical service and support, which allows our residents to safely roam our facility while..."
"The system has already been a life saver (literally!)." "We installed the Accutech wander management system in 2017. It was an easy choice as I had previously replaced a Code Alert system with Accutech at another facility. Accutech is..."
"I like the ResidentGuard wander system because it allows our residents to have freedom of movement without feeling like they are being policed. The notification comes through on our nurse..."
"We use our LC 1200 system as an elopement prevention system of our LTCSNF. 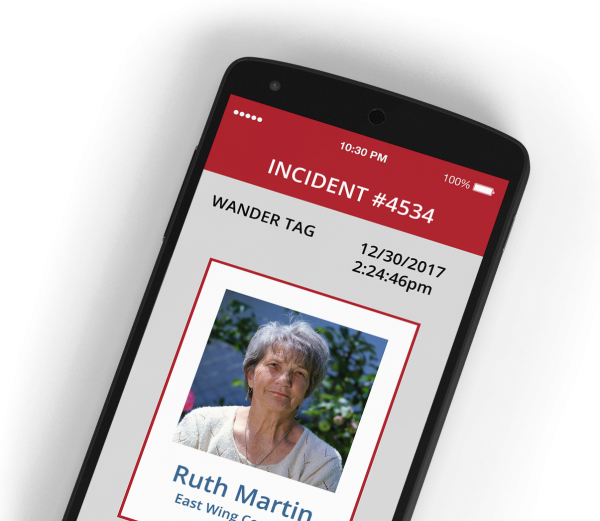 It has been in use for 3 years and integrated into our existing Nurse Call System..."
"The ResidentGuard wander management system has been one of those set it and forget it type of systems. All the systems are great and when we have to call for..."
PROTECT RESIDENTS WHILE MAINTAINING THEIR DIGNITY WITH THE "WANDER WEARABLE". SEARCHING FOR A WANDER MANAGEMENT SOLUTION? 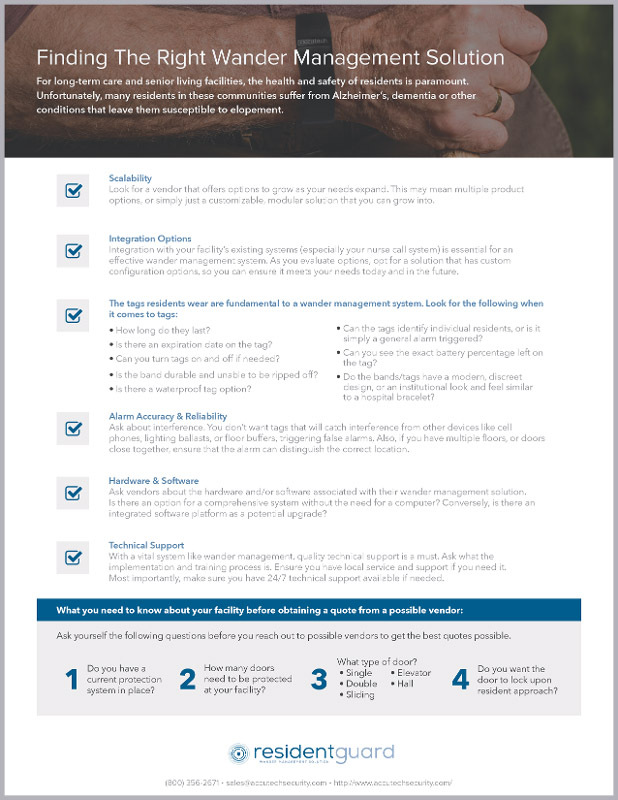 Not all wander management solutions are created equal. Learn about the technology we use in our systems. 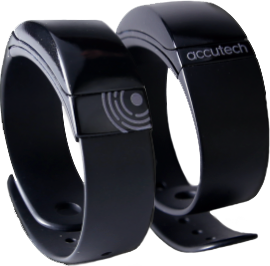 Accutech’s “wander wearable” is a less institutional, waterproof, wearable style device designed exclusively for its wander management solution, ResidentGuard. The wristband/tag combination protects wander-prone residents when used in combination with alarms and other security features. The tag test station gives current and future users the ability to see the remaining battery life and warranty date on ny resident tags. The tag test Station also allows users to see the tag program number, battery percentage and has a field for notes. The ID-TAD (Identification-Tag Activator/Deactivator) is a handheld device that brings additional functionality to all Accutech systems. Staff can turn tags on/off, verify tag numbers, review warranty dates and check remaining battery life from an LCD screen.The ID-TAD is rechargeable via a lithium-ion battery. All ResidentGuard systems are shielded against RF interference for the life of the system. Each tag operates at a unique frequency (418 MHz) on the edge of a range available only to the Department of Defense. The embedded ID code on the RFID chip in addition to the unusual frequency it is transmitted on combine to make ResidentGuard the most reliable wander management system available—minimizing the problem of false alarms. ResidentGuard systems can be seamlessly integrated with wired & wireless nurse call systems. The system can also be integrated to paging/email, access control and CCTV systems. 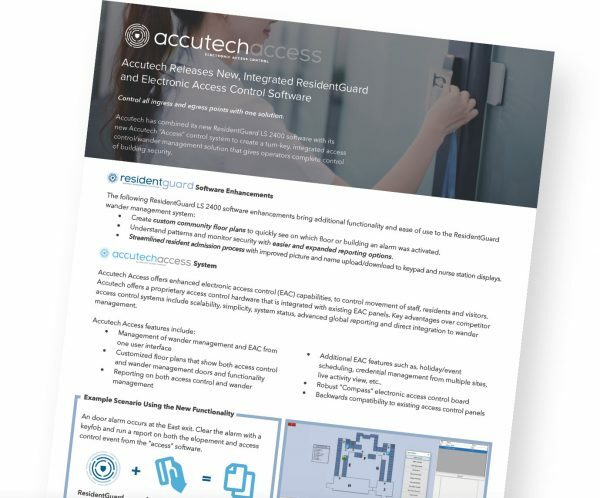 Accutech's Residentguard software gives users the ability to create custom floor plans, run crystal reports, add resident photo and tune zones remotely. The system can also be integrated to the Accutech Access electronic access control (EAC) system, or scaled up to the Accutech Integrated Solutions platform (to be released in Q2). If a community wants integration between EAC, Video and wander management. After attaching a picture to a tag number in the software, the resident photo can be displayed at a local keypad or nurse's station. Centralized reporting on all doors and resident tags allow for easy filtering and customizable report generation that allow you to spot trends and understand system dynamics. 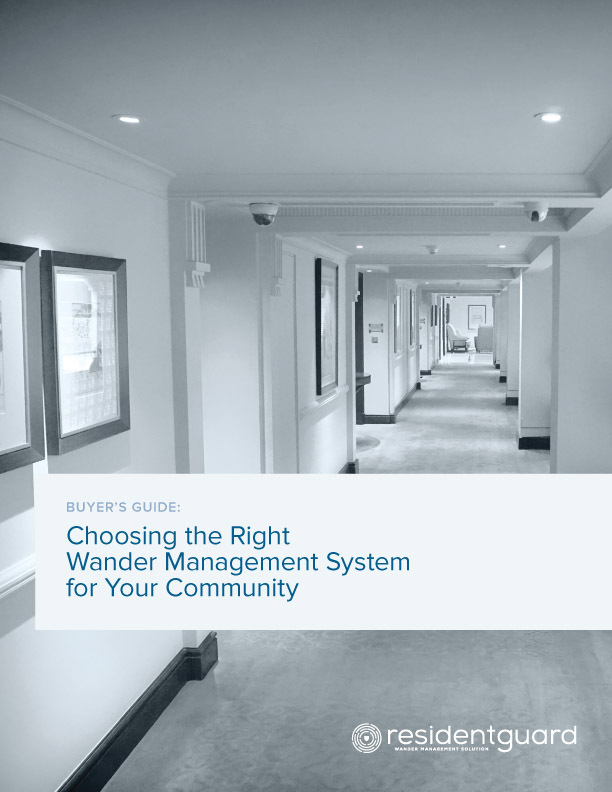 HOW DO OTHER WANDER MANAGEMENT VENDORS COMPARE?